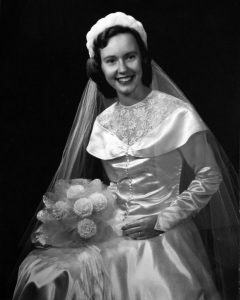 Little did we know when the October wedding of Princess Eugenie was announced she would turn straight to the 1950s for inspiration. Designed by British Peter Pilotto & Christopher De Vos the duo behind label Peter Pilotto created a dress so 1950s we can almost hear ‘Love Is A Many Splendored Thing’ playing. In the early to mid 1950s the shawl collar became fashionable – that’s a collar which wraps around a V neckline and is either small in depth or wider often flaring over the shoulders too. Like her mother Sarah Ferguson on her marriage to Prince Andrew in 1986 she wore a tight bodice and wide flared skirt also very 1950s in inspiration. 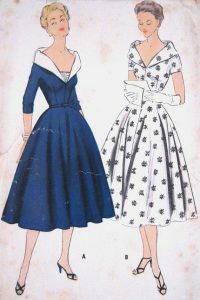 McCalls 3074 sewing pattern. Bust 30 inches. Shawl collars and wide skirts design features of the day. But this very modern royal chose to deliver a message in the back V.
With thousands of eyes upon her she said “I’ve got one too” to all those with scars from Scoliosis surgery for curvature of the spine. The new Mrs. Brooksbank had a hands-on approach to the silk Jaquard fabric designing symbols woven into its cloth meaning something to her as a woman. The original shawl collar with lace insert. 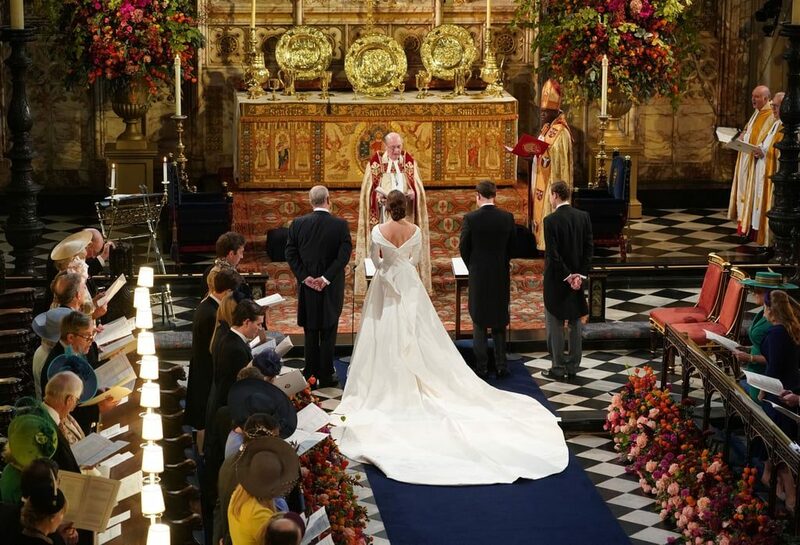 A modern-day mix of Princess Eugenie and Kate Middleton’s wedding day designs. Like the layers and brocades seen in Hull dressmaker Betty Bartlett’s designs we’ve loved 1950s wedding dresses for their instant elegance and ability to suit all silhouettes. 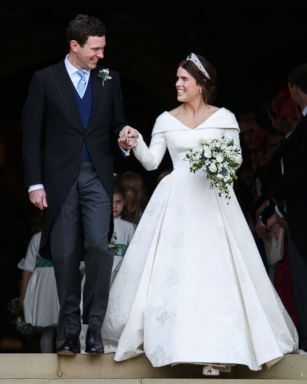 A tight bodice, drop shoulder and full skirt can fulfill romantic dreams on the big day for not just royals but anyone. 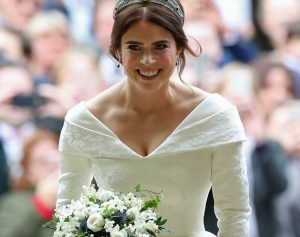 Congratulations Princess Eugenie we hope ‘something borrowed’ from the 1950s brings you a lifetime of love and luck with your new husband.